It didn’t bode well for the journey back to the airport when the taxi started rolling away as the driver loaded our small, not very heavy bags into the boot of his car. Should we really be getting into a taxi with a driver who didn’t know how to use his handbreak? I thought. But I didn’t know the Spanish for ‘I’m sorry, but your taxi looks a bit scary’ so I just said “El aeropuerto por favor” and got in. Every time a car slowed down in front of us, perhaps because it was trying not to crash into the car in front, or run over a pedestrian, or because it could see the traffic lights up ahead were on red so there was no point in moving towards them at top speed, he hit his horn at them. “Do you think that Spanish taxis should just have the horn on as a default?” asked Paul once we were out of earshot and had breathed a sigh of relief that we were still alive. “Then they could just press it when they don’t want it to make a noise.” Seemed like a perfectly reasonable suggestion to me. Then we got on a plane and, after an hour of sitting still in uncomfortable Ryanair seats while we waited for the French to give us permission to fly over France, flew back to a land where meals aren’t all served in tiny portions, where the sun doesn’t shine quite so consistently, and where I understand more than 10% of what the people around me are saying. During my Spanish classes this year, I often sat next to Trevor who always had difficulty in retaining much of the vocabulary that we were learning throughout the course. There was one thing he did remember though: no matter what topic we were practising, he could always remember un bocadillo de jamón – whether it was that he wanted to order one during our café roleplay, or whether he liked them, or that he was going to eat one next weekend, or that he ate one last weekend, he’d always manage to slip it into the conversation somewhere. I thought about Trevor, and how many bocadillo de jamóns he would have eaten if he had been in Seville for the weekend as I ate mine for a late breakfast that morning. One of the things I remember most about my last visit to Seville, was hanging out at the Plaza Español, watching the horse and carts circle around the fountain before proceeding on their merry clip-cloppity way back to the cathedral. Arriving there a second time, the first thing I noticed was that it looked a lot more building site-y than it did in my memory, since the main part of the plaza is being reconstructed at the moment. 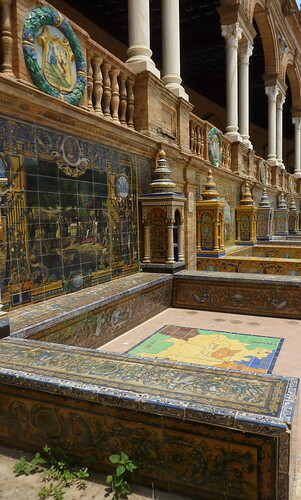 Luckily we were still able to wander around the building surrounding the plaza, admiring the artwork built in ceramics on every wall, staircase and ceiling. It was a lot bigger than I remembered, confirming my suspicions that my brain must compress things into smaller files to save space for anything that might come later. On a Sunday afternoon in Seville most of the museums close, so it was back to the hotel for a siesta and this time, a few beers out on the patio, (to save the stress of having to remember to buy a screw top bottle of wine) before heading out into the night for a cruise along the River Guadalquivir. We hoped to learn about why there were padlocks fastened all along the Triana bridge and to pick up a few other bits of historical trivia all for the bargain price of €15. So for 45 minutes of my time and €15, I had a breezy sunset trip up the river and learned absolutely nothing about the city I was visiting. Bargain. The first task of the day was to find breakfast. Mindful of the previous evening’s experience of wandering around for hours passing lots of different cafes and bars without being able to decide which one to go in, we headed straight inside the first one we saw and took our seat in the bustling café which appeared to be manned by just one waiter, a fierce whirlwind of activity, crashing around at top speed, taking orders and delivering food to every table with an abrupt efficiency. To his credit, his waiting style allowed me to order in Spanish without him making any attempt to ‘help’ out by replying in English, making it my second successful entirely Spanish transaction of the weekend. It was a brief and happy interlude before entering the cathedral, the 2nd largest in the world to while away a few hours out of the intense sunlight with what seemed like every other tourist in the city. “There’s a room in Resident Evil that looks a bit like this” commented Paul as we looked inside one of the many rooms inside the enormous structure. 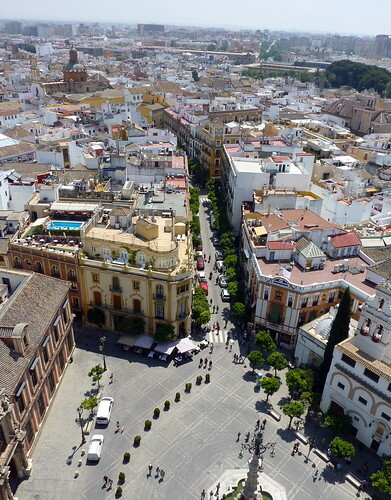 And up in the bell tower we found sprawling views of Seville, from above. 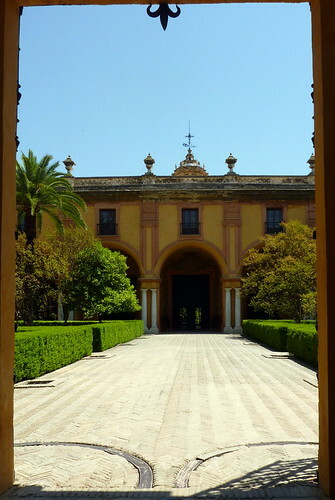 After another quick tapas stop it was onto the Alcázar to wander slowly around the ornate buildings and immaculate gardens, to lie on a bench in the shade, watching the Peahen scaring the ducks, stalking peacocks through shaded gardens and for a delicious lemonade in the cafe. In true holiday tradition we went in search of a shop to sell us a screw-top bottle of vino tinto to consume out on the patio which came with our hotel room. And in true holiday tradition, we bought a cork sealed bottle and realised once we were far enough away from the shop to have forgotten where it was. 15 minutes later, with the help of a car key, a pair of tweezers, a pencil and a toothbrush, we were sitting outside on our private patio sipping Rioja and reading. Flicking through the Spanish TV channels I saw a matador being knocked to the ground by a bull during the bullfighting broadcast. I watched Julia Roberts and Richard Gere speak in strange Spanish voices in a film that was not Pretty Woman. “Where are we going?” I asked that morning. I don’t remember much about Seville from the last time I was there. My mind was a whirl after finding myself unexpectedly travelling solo and I was just happy to be able to find someone to talk to. At the time, I described it as being very much like my home town – York, with its cobbled streets, big cathedral, old buildings, etc, but with the addition of orange trees lining the streets and the sunshine making an appearance in October. Following my second visit, I’m more inclined to describe it as like a level in Zelda. To find our room in the hotel, we had to go up some stairs, then choose another staircase of the many on that floor, to go back down to the same level we started at, but a different corner of the building, navigating around the twisting corridors in the hope of finding the door for which we had the key to unlock. As the porter led us to our room, via the second floor, I looked at Paul and pointed to the 102 clearly marked as our room number on the card holder I’d been presented with at the reception desk. He looked back and shrugged, but since I’d checked in using my limited Spanish, all of the staff were speaking to me in Spanish, and I didn’t want to revert to English to ask where we were going, so dutifully followed. I understood most of what they were saying, but couldn’t articulate any more than ‘si’ and ‘gracias’ in return. Wandering the streets in search of extra hearts (err… I mean tapas) that evening, it struck me how little I actually remembered about Seville from my last visit here. I remembered Kev the Canadian, and Mia, the Swiss girl and Erin the American, but the actual place had shrunk almost to nothing in my mind – I remembered going into a traditional Spanish bar where a traditional Spanish man played traditional Spanish songs on the piano, but I had no idea where to find it. 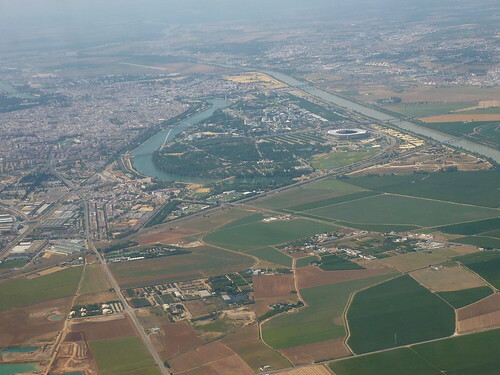 I remembered that there was a big cathedral, but was convinced that I didn’t know about the big river, which is quite hard to miss, if you’re visiting Seville. There was one moment where we walked past the hostel I stayed in the first time round, where I felt a tiny flicker of recognition, but then as fast as it emerged, it was gone again along with my bearings. Everything seemed bigger than it was in my memory – as if I’d compressed it to preserve space. P.S. 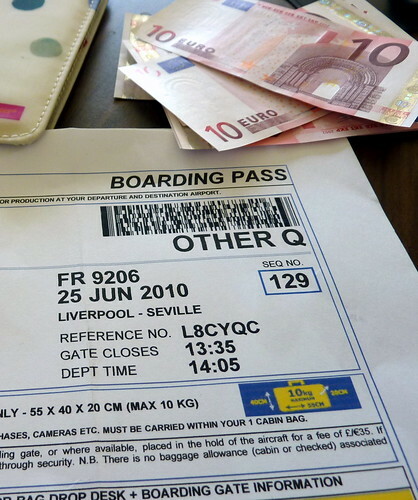 Could you drive me to the airport on 25 June? P.P.S. Oh and could you drive me back on 28 June? P.P.P.P.S. Bring your Spanish knowledge with you! 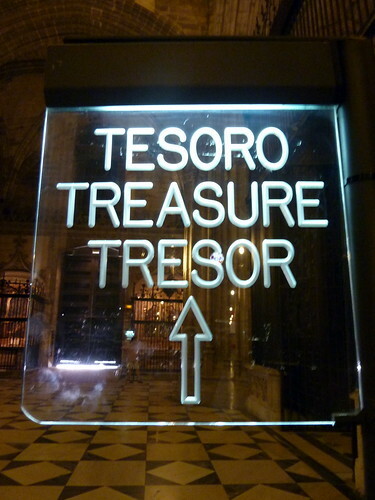 After purchasing a train ticket to Alicante (the InterRail Pass had run out), I had 6 hours to kill. 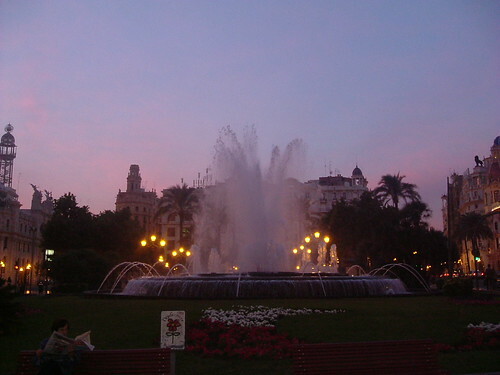 As the sunniest day yet seemed to have arrived, I sat reading by the fountain which had marked my arrival in Valencia. It was how I had spent my first few hours there and so seemed apt to spend my last few hours there too. The 34° heat soon got the better of me and so I ended up returning to the hostel to finish the book. That afternoon, I was simply waiting to go home. I felt hot, sweaty and tired. 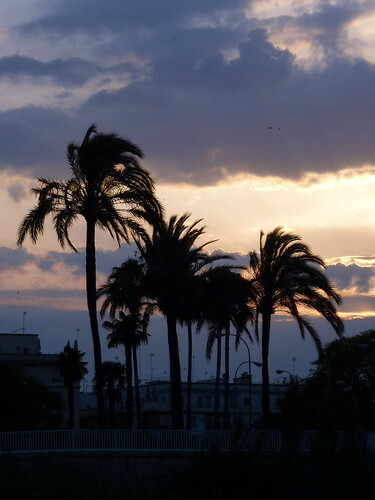 I arrived in Alicante on the train at 6:30pm and set about finding the bus station. When I got there I couldn’t find any buses to the airport. I should have asked, but couldn’t muster the effort to attempt to communicate in a language I didn’t understand, so returned to the train station to get a taxi instead. On the 10 minute drive there, I watched the palm tree lined streets float past my eyes while some ballady love song played on the radio and for the first time that day I felt sad that I was leaving. The trip had been exhausting, often hard, often enjoyable, but most of all it felt good to have achieved something. I had learnt a lot and finally felt like I actually could be a backpacker. I was glad that I had the chance to have those 9 days alone because it let me see that travelling alone wasn’t so scary after all and I knew that I would look to travel some more in the future. Unsure of what to do with my final full day in Spain, I set off with the idea of buying biscuits for the people at work. When I stepped outside the sun was shining oppressively and I felt too exhausted to walk around too much so made my way back to the beach again. After a metro ride and a 20min walk past the university and a large black bull I sat down on the sand with my book and tried to stop sand from being blown into by eyes by the brisk breeze. It was suddenly very cloudy and windy which is why it wasn’t very long before I returned to the hostel. That evening I made small talk with Kev the Canadian, Troy the Australian and Björn the German and joined them for one drink at a nearby bar before returning to my bed for some sleep. The night train was surprisingly comfortable to sleep in (considering that I’d opted for the cheap, non-bed seat) but my arrival was just before 6am and I assumed that I wouldn’t be able to access the hostel until at least 10am. I found a bench next to a fountain near to the station and sat there for a few hours, simply watching the sun rise through my tired eyes. I liked Valencia immediately. Although it is a large city, it is a nice one. After dumping my bags at the hostel, I found my way to the beach where I sat alone, watching the sand slide between my fingers and not thinking about very much. It wasn’t long before a Spanish man called José, dressed in white paint-splattered dungarees approached me and said something to me in Spanish. I didn’t understand. I got my phone out of my bag and waved it in his face so that he could read the time for himself, then went back to my book, expecting him to walk away. But he kept talking at me. In spanish. “No hablo Español.” I repeated several times while we established that, with the exception of that one phrase, I spoke no Spanish whatsoever. It didn’t seem to put him off though. “Soy un pintor” he persisted, pointing to his paint splattered dungarees. I problably just nodded, which probably told him that he was fine to go on speaking at me in a language I didn’t understand. “No hablo Español,” was all I could say. He pointed to my eyes. Looking back now, I think I know what he was saying – he was saying “Me gustan tus ojos” or something to that effect. Then he tried to kiss me so I got up, said “NO” and walked away. Thankfully he didn’t follow. Met a new Kev the Canadian at the hostel that night. My train to Valencia wasn’t until 10.00 that evening so I spent the entire day hanging around at the hostel, waiting to leave. It was probably the first time during the trip that I felt bored. Still, the Oasis was a good place to hang around doing nothing in and it did give me the opportunity to catch up with Erin the American and some Australians for tea in the Kasbah, an arabic tea shop round the corner from the hostel. 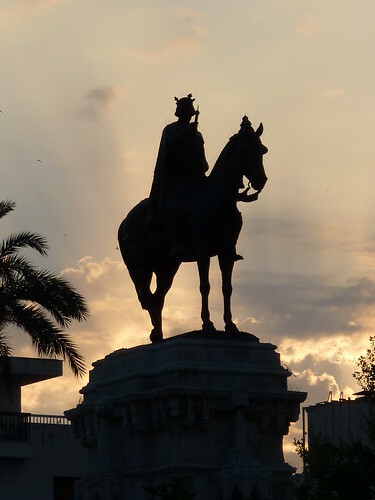 As I’ve already mentioned, when I first arrived in Granada, it appeared to me to be a dirty, unattractive city, much of which was being dug up and it was fortunate that I wasn’t there for the sightseeing. On arrival at the hostel, I realised that Granada did have one thing going for it – a lively nightlife: In Granada Tapas is done how it was always intended – you buy a drink and the food is free. 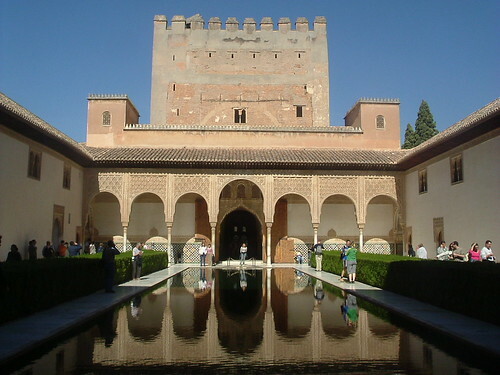 For these reasons, it wasn’t until my third day in Granada that I ventured very far from the hostel on the insistence of fellow travellers that I simply must go to see the Alhambra. So I did. As was my habit in this town, I got lost very quickly and the map was next to useless as I tried to pick my way through the tangled streets. For once I was actually pleased at my unintended detour because it took me up into the mountains via the winding cobbled pathways of the yet unseen Granada Old Town. I discovered that, far from the unattractive city I had presumed it to be from first impressions, it is a beautiful place which extends far up into the mountains. I was once again beginning to appreciate Spain for being a much nicer place than I had given it credit for. On the top of a hill I stumbled across Antoine from the hostel who had decided to draw Granada in place of taking photos. After about 2 hours I found the Alhambra and spend several hours wandering around the spectacular Arabic Fortress, overlooking the city. I walked back to the hostel the correct way and was surprised to discover that it was only 15 minutes from the hostel. Damn map. Must have been faulty. That evening I enjoyed a few drinks with Antoine, Cristophe and the Dutch guys.